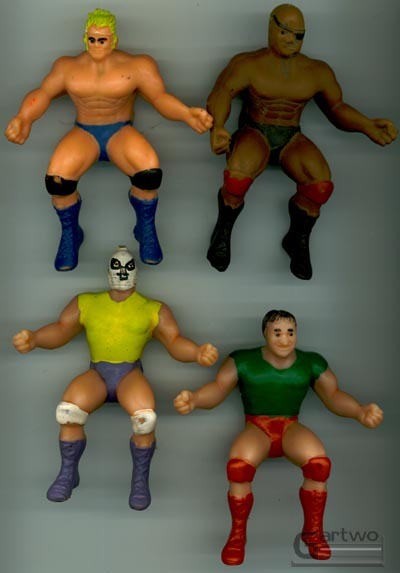 Below you will find several different obscure generic thumb wrestlers i've come across. I don't know who they are, who made them, or where they came from. But I do know that they are cool enough to be included in Gartwo's collection! These two dudes are probably the most common thumb wrestlers in the world. They are showing up on eBay all the time. 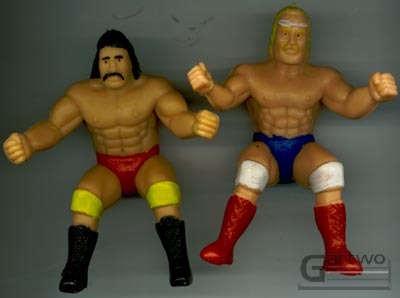 I don't know who the guy on the left is supposed to be, but the guy on the right with the blonde hair and moustache is obviously supposed to wrestling legend Dave "Evad" Sullivan....who'd you think I was going to say? 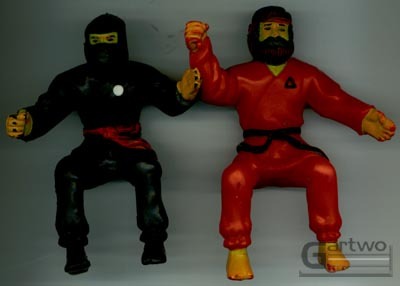 Technically these guys are more like Thumb "Ninjas" instead of Thumb Wreslers. Regardless, they are some of the coolest in my collection. Unlike the others, these guys have trademark info on the back. It says 1988 Lanard Toys. Anybody have any info on them? Check out this wacky cast of characters. The guy in the blue short's head is about 3 sizes to small for his body. He cracks me up! The dude in the green shirt looks like the Roddy Piper LJN Thumbie's ugly cousin. Eye Patch guy and the guy with the mask actually look pretty cool.